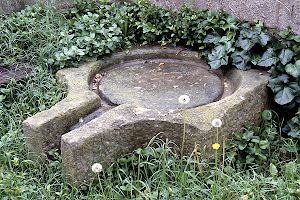 Castillazuelo is situated in the valley of the Río Vero near Barbastro. Both should be on any map. From Barbastro's city center take the road towards Adahuesca and Alquézar. You will soon reach Castillazuelo. The equipment is on display near the village center in the Calle Estadilla . 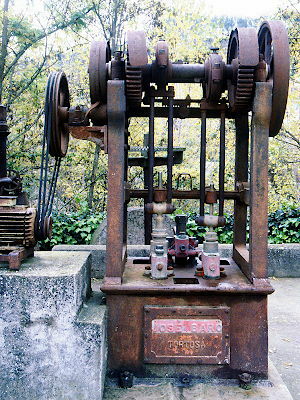 (1) The display with the oil pump and the hydraulic press — 2002. 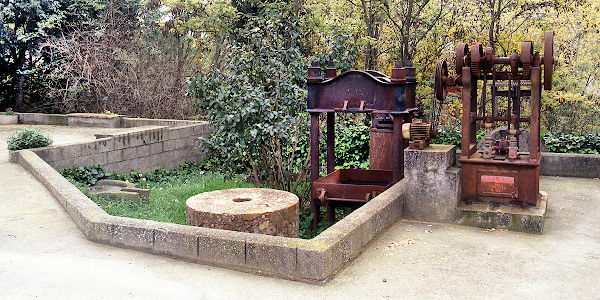 (2) Malaxator; hydraulic press with trolley; oil pump. (3) Oil pump for the hydraulic press. The equipment on display brings the torno of Buera to the mind (†). 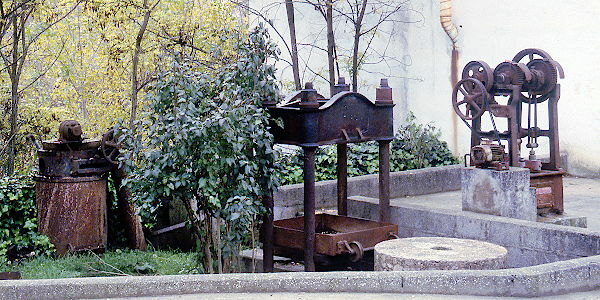 In this village a configuration with the same machinery of the same brand can be seen. The main difference is that in Buera the equip­ment was moved by a system of belts driven by one engine while here, in Castillazuelo, the oil pump and the malaxator (batidora) each have their own electromotor (3,7). 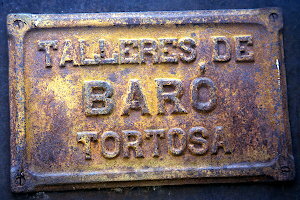 Near the end of the 19th century Talleres de Baró was founded by a certain Francisco Baró and later on the company was managed by his son who was also named Francisco. This one died in 1947 (10). It appears that the latter Francisco's son also was named Francisco, or Paco, (‡). 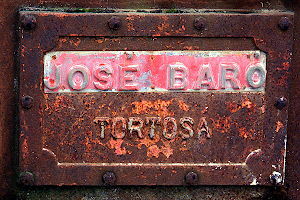 It is not clear who the José Baró is on the tag (5) of the oil pump. 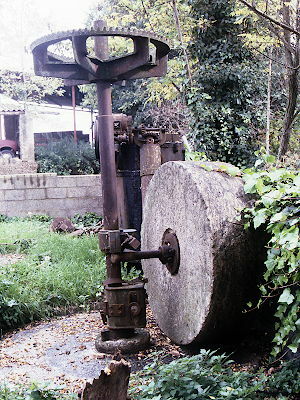 Some items of an earlier generation are also on display: an bottom plate of a press (8) and an old rollerstone (9). At the time of our visit in 2019 the display seemed unattended and was overgrown with ivy and high weeds. Some of the devices were broken or used as a bin for empty cans and plastic bottles. (4) Tag on the head of the press. (5) Tag at the foot of the oil pump. 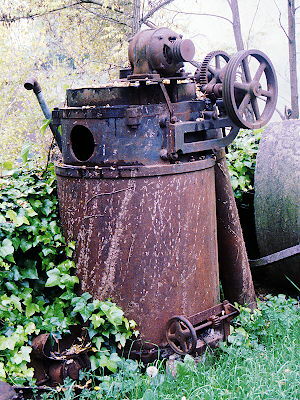 (6) The olive crusher ( torno ). (7) Malaxator ( batidora ). 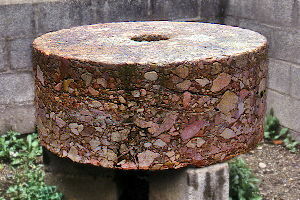 (8, 9) Remains of a previous generation of equipment: bottom plate of a press and roller stone. 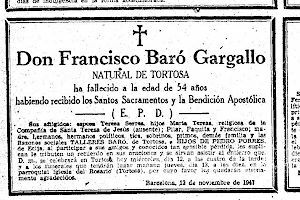 (10) Obituary in La Vanguardia Española 12.X.1947. We have seen some products of Talleres de Baró in Angüés also. Ana Espuny Rodríguez — 2010 — Evolución de las Almazaras. Cuadernos de los Amigos de los Museos de Osuna, N° 12; pag. 18-24.